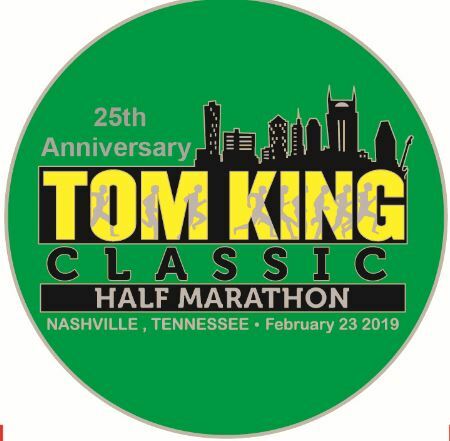 It's been 25 years so please join us for the silver anniversary of the Tom King Classic! We've brought back a grand and favorite tradition - we're finishing on the field under the jumbotron! Event features a Half Marathon and 5K Run/Walk, staged at Nissan Stadium, home of the Tennessee Titans football team. Each race is out and back over certified and flat courses with the Half Marathon route taking runners out to Shelby Park and along the paved Shelby Bottoms Greenway, that runs along the Cumberland River. At the completion of the course, enter the stadium tunnel and finish your run on the field of the Tennessee Titans! Then celebrate your accomplishment with post race food and awards in the stadium parking expo. Please note: Half Marathon is limited to 1200 participants. Guaranteed shirts for registrations by 2-10-19. Early packet pickup will be Friday afternoon 2/22 from 3 pm - 6 pm at Nissan Stadium - East Parking Lot. Race morning packet pickup beginning at 6:00 AM. Please bring photo ID when picking up your race packet. Same day race registration will be available until 7:45 AM. Parking is free both Friday afternoon and race morning in Lots C & D, directly across from Gate 1.